The Soul Kit is a compact and lightweight pocket vaporizer made for use with thin essential oils that comes equipped with some unique features that certainly sets it apart from the rest. The Soul Vaporizer sports a pocket-sized body that perfectly contours to the palm of your hand for discreet vape sessions on the go. Measuring in at around 2.5" tall by just over 1.5" wide, the Soul Vaporizer is easily concealed in the palm of your hand, perfect for those looking to take quick and stealthy inhales without anyone noticing. Unlike many other similar models, the Soul Vaporizer grants you the option of adjusting it's output level to match your preference. Some thin essential oils may require a higher output for ideal results while others may see better results under a lower voltage, with the Soul Vaporizer you are capable and ready to do just that. To adjust the Soul's output level you will first need to power on the device by quickly pressing the fire button 5 times. After that you will then press the fire button three more times to toggle through each output level. The Soul Kit comes equipped with three preset optimized output levels (3.2V, 3.6V, 4.0V) that are each shown by a different colored LED light indicator. Each time the output is adjusted you will see one of the lights blink three times with green indicating the minimum voltage output and red signifying the maximum output level..
After pressing the power button just two times while the device is powered on you will initiate the unique preheat feature. Essential oils are often sticky and will become stuck in the top and sides of your atomizer, preheating gives you the opportunity to loosen up this material to ensure it makes it's way down to the heating element to ultimately prevent waste and guarantee you are getting the absolute most out of your oils. The Soul Vaporizer is powered by an embedded 1000mAh lithium-ion battery that comes equipped with pass through charging that allows you to continue vaping while you recharge. 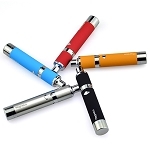 Vaping thin oils requires very little power, therefore the Soul Vaporizer's battery should function for days on end before eventually needing a recharge. When that time does come connect to the included magnetic USB charging cable to get a full recharge in just around 2.5-3 hours. Each Soul Vaporizer kit comes stocked with a removable and refillable Liberty tank cartridge that can hold up to around 0.5mL of oil at a time. This cutting-edge atomizer features a top adjustable airflow control ring for full control over your vapor output. Looking for thick, satisfying clouds? Open it up wide or keep it closed for a thin and discreet vape during travel. 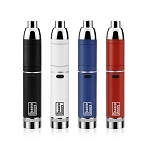 As many other similar vaporizers in it's class, the Soul's Liberty atomizer utilizes the convenient magnetic connection system. 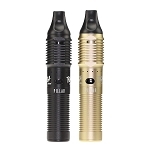 This innovative connector uses strong magnets to create a secure and reliable connection between the atomizer and battery. 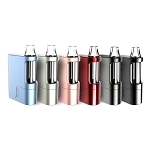 If you are one who prefers using your own pre-filled oil vape cartridges, simply remove the included magnetic adapter from the Liberty tank, attach it to your atomizer, drop it into the Soul's housing and you are ready to go. If you are in the market for a discreet pocket vaporizer that looks as great as it functions, consider investing in the Soul Vaporizer Kit today you will not be disappointed! I received my Soul kit and cartridge refill kit add-on in an exceptionally timely manner! Everything arrived safely and discreetly wrapped, and the Soul's performance beyond exceeded my expectations.